The C. Hager & Sons Hinge Company Buildinga at 139 Victor Street, listed in the National Register of Historic Places, are among the few buildings not demolished as part of the Kosciusko clearance project. Governed by a five-person board appointed by the Mayor, LCRA became the means for a variety of ends in redevelopment. At the end of 1953, LCRA attracted a new Executive Director, Charles L. Farris, former Deputy Director of the Federal Slum Clearance and Urban Redevelopment program, Housing and Home Finance Agency, Washington D.C., Farris previously had been appointed by LCRA Board of Commissioners on the recommendation of new Mayor Raymond R. Tucker. 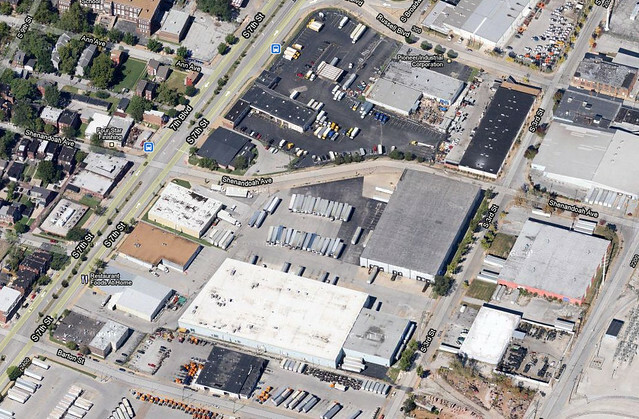 Kosciusko around Russell Boulevard with Broadway and the Soulard neighborhood at left. View is looking north. 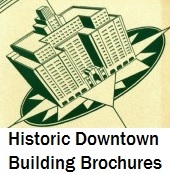 Under Farris, LCRA moved rapidly to implement the redevelopment recommendations of the 1947 plan. One endeavor was the clearance of the Kosciusko district, which city planners envisioned as an appropriate district for industrial expansion. Kosciusko was a dense, somewhat-rundown assembly of 19th century brick commercial buildings and tenements as well as industrial facilities that had sprung up on the riverfront and expanded into the neighborhood. 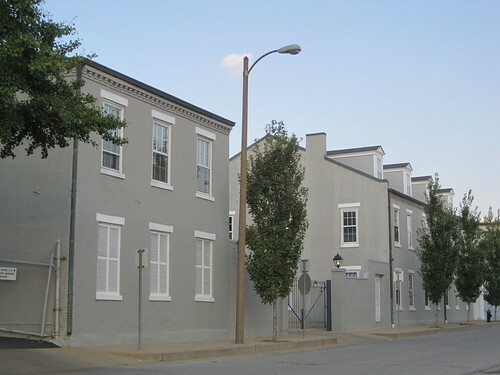 Kosciusko had many social and physical ties to the adjacent Soulard area, and, in fact, architecturally was greatly similar. Like Soulard, the 2,941 residents of Kosciusko were predominantly poor. The housing stock was substandard, and the industries were land-locked with little alternatives except moving out of the district. In order to retain the industries, Farris and others believed that the entire Kosciusko district needed to be cleared wholesale, and rebuilt with plenty of open space for expansion of major industries including the Nooter Corporation, Monsanto, American Car and Foundry, Anheuser-Busch and the Bemis Brothers Bag Company. Nooter Corporation’s expansion plan fit right into the LCRA plan for Kociusko, and in fact became the first project to be started and completed in the urban renewal area. Nooter built a new office building at 1400 S. Third Street and new fabrication facilities on Second Street. By the end of 1958, LCRA finalized its Urban Renewal Plan for the Kosciusko Urban Redevelopment Area. The plan called for clearance of 221 acres on 70 blocks with rough boundaries of Dorcas Street on the south, Second Street on the east, the proposed Interstate Highway 55 on the north and Seventh Street on the west. Within the district were 34 acres of existing industries and 54 acres LCRA wanted to set aside for industrial expansion. The project was envisioned as powerful enough to attract $100 million in investment to the area, demonstrating urban planners’ recurring use of large, round and speculative economic figures to advance redevelopment plans. Also included in this area were 89 acres of streets and alleys that planners saw as wasted space. The plan called for a streamlined street plan, elimination of residential zoning, few alleys and — most radical of all — the southern termination of Broadway at Russell Street and the redirection of Broadway’s traffic onto Seventh Street. Furthermore, the plan entailed demolition of 97% of existing structures within the LCRA boundaries and LCRA itself acquiring 65% of all land outright. The project was envisioned as powerful enough to attract $100 million in investment to the area. In August, Farris secured contracts from existing merchants who wanted to remain in the district occupying the new buildings of the envisioned commercial center. On December 5, 1958, the St. Louis Board of Aldermen unanimously approved the enabling ordinance. Nooter was ahead of the city’s schedule, breaking ground in July. The St. Louis Globe Democrat praised the project in an editorial that appeared in its December 8, 1958 edition. “This word ‘re-development’ does little to reveal what will be taking place,” boasts the editorial, which claims that the Kosciusko and its contemporary Mill Creek Valley urban renewal plans were the “first in-town urban industrial parks of any size planned for any American city.” The Kosciusko urban renewal plan was certainly a unique experiment locally, although its basic program of site assembly for industrial expansion was similar to the Nooter Corporation’s private efforts for the previous fifteen years. In May 1959, LCRA announced that it had secured a little over $14.3 million from the federal government for land acquisition and clearance; this covered the estimated $10.7 million needed to buy out the entire area plus other costs. View of the Nooter Corporation's plant, with the two-story brick office building in the foreground and a fabrication building in the bakground. Some buildings have been demolished. View is looking east. LCRA’s acquisition of land in the renewal area did not begin until November 1959, when the Nooter Corporation Building was completed. When dedicated, the Nooter Corporation’s new office building was “the first major new structure” in the redevelopment area. The completion of the project was a milestone for LCRA, eager to see the Kosciusko project thrive and to have an encouraging sign for other businesses in the area. By 1963, LCRA had largely completed the redevelopment of the Broadway commercial district, which was rebuilt as a shopping district that retained many existing businesses in new buildings. Other investments came in the following years as 23 new firms and 11 existing firms built new buildings and facilities in Kosciusko. By the end of the project, $21.8 million was spent on the transformation of Kosciusko, markedly short of the original target but substantial nonetheless. 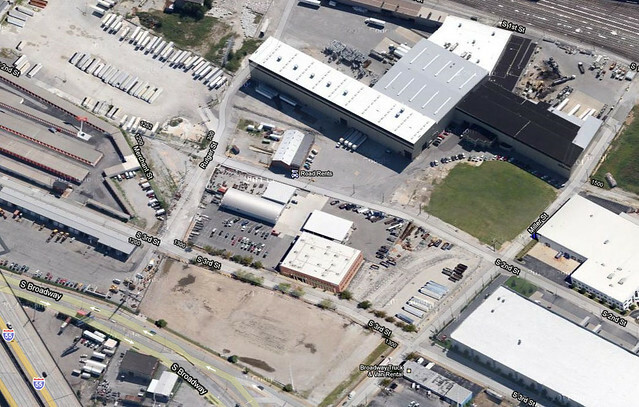 The Kosciusko Urban Renewal Plan definitely succeeded in remarkably transforming the district, increasing available industrial-zoned acreage and retaining existing companies like Nooter, which expanded its plant to 36 acres during the redevelopment. However most of the area was never fully redeveloped, and today Kosciusko is a mix of urban-renewal-era buildings, paved open areas, historic buildings that remained and many acres of vacant land. Delugach, Al. “Kosciusko Area Project May Be Completed in ’67,” St. Louis Globe-Democrat, 24 November 1966. Land Clearance for Redevelopment Authority. Urban Renewal Plan for the Kosciusko Urban Redevelopment Area. (St. Louis: LCRA, 1958). —. Facts About Urban Renewal in St. Louis. (St. Louis: Land Clearance for Redevelopment Authority, 1963). “New $800,000 Nooter Executive Headquarters Building Dedicated,” St. Louis Globe-Democrat. 20 November 1959. Schafers, Ted. “Nooter plans to expand its St. Louis plant,” St. Louis Globe Democrat. 18 October 1972. This entry was posted in Kosciusko, LCRA, South St. Louis. Bookmark the permalink. What happened to Nooter? Are they still in business? There’s an effort to rebrand the stranded section of Broadway in Kosciusko as “Old Broadway” or “Behind Broadway” in recognition of the fact that 99% of St. Louisans think 7th Blvd. is Broadway.